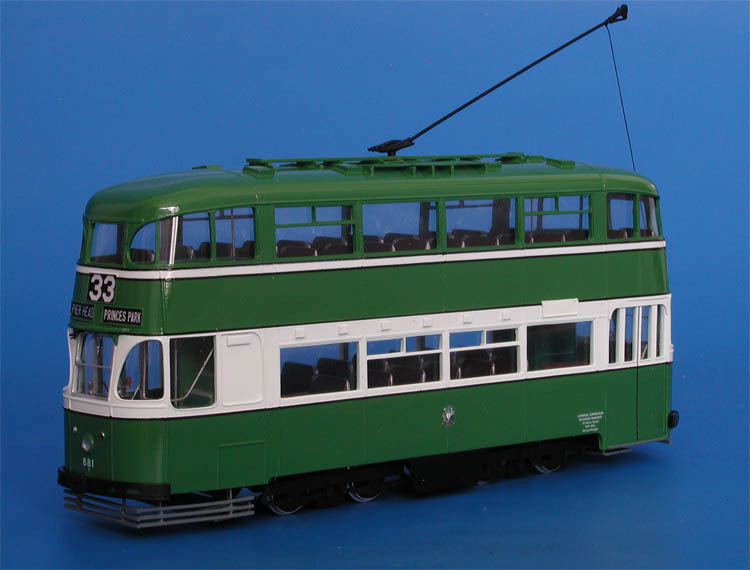 Model 1936/37 liverpool corporation "green goddess" tram (post'50/53 version; emb lightweight bogies). 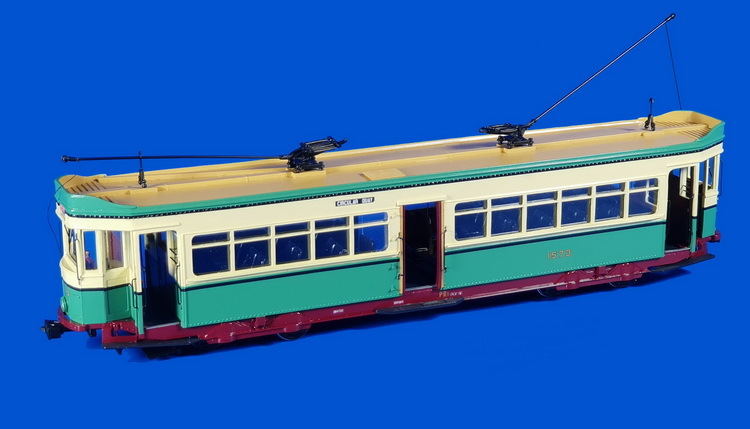 1936/37 Liverpool Corporation "Green Goddess" Tram (post'50/53 version; EMB Lightweight bogies). The City of Liverpool had, during 1920s and 1930s, one of the most progressive tramway system in Britain. Under management of W.G.Marks the first designs of the new streamliners appeared in January 1935 and in February the Corporation agreed on a modernisation plan and authorization was given to building 50 cars; in June 1936 the first of new cars, No. 868 was produced. Twelve cars (868-878 and 880) were equipped with EMB Heavyweight radial arm bogies of the 'Joburg' design, while EMB Lightweight bogies were fitted to the remaining 38 cars of the first batch. The second batch of the streamliners was built with Maley & Tauntob bogies, these cars were numbered 918-942 and were built between September 1936 and November 1937 and deliveries continued along with the first batch. A further, third batch of cars was authorised in March 1936, the bogies were installed of reverse scheme used in the first batch: twelve cars (943-952,955,957) were fitted with EMB Lightweight bogies and remaining 38 cars received EMB 'Joburg' bogies (953,954, 956-992). The fourth, and final batch was ordered in November 1936, only 38 cars were delivered (Nos. 151-188), all except car 181 were fitted with EMB Lightweight bogies, 'Joburg' bogies were installed on car 181. First three Green Goddess trams entered service on 11 June 1936. 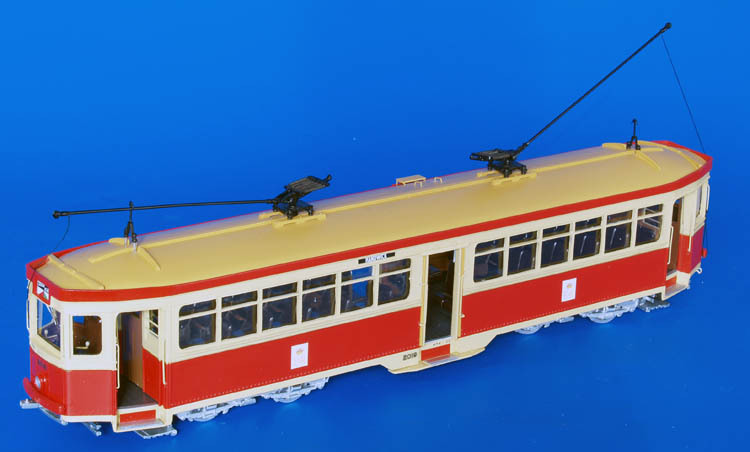 By 1950 there were some 100 modern trams out service and between 1950 and 1953 146 streamlined cars underwent major reconstruction. Bodies were strengthened, sliding windows were fitted, trafficators were removed (survived on some cars, being painted over), girder type buffers were installed; a number of cars received replacement bogies etc. The livery was also changed: the pre-war olive green was replaced by different shade of green. 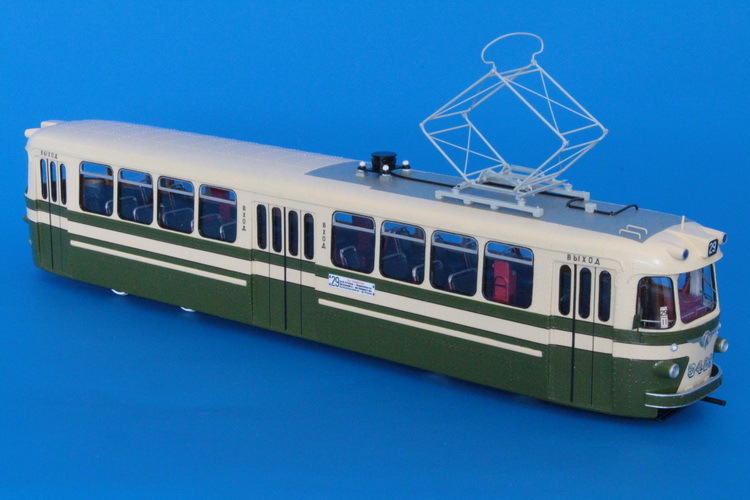 In 1953-54 fourty-six Green Goddesses were sold to Glasgow Corporation Transport. The remaining cars served Liverpool until November 1956; the system was finally closed in September 1957. 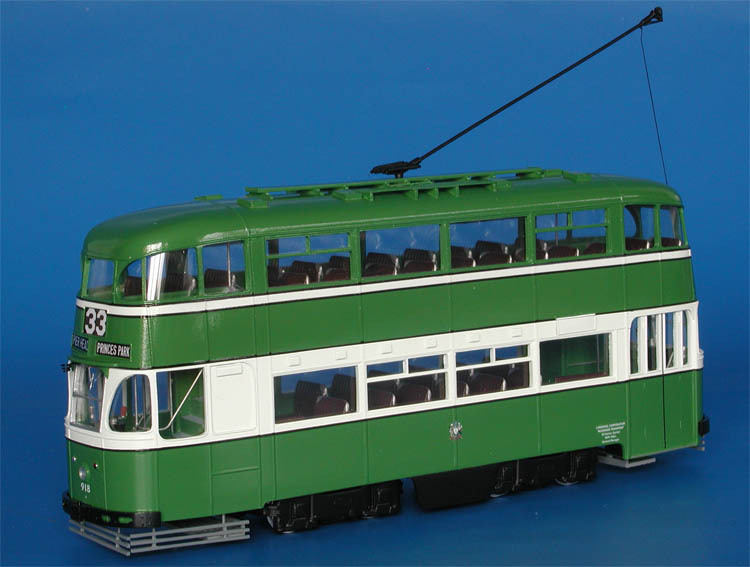 1936/37 Liverpool Corporation "Green Goddess" Tram (post'50/53 version; Maley & Taunton bogies). 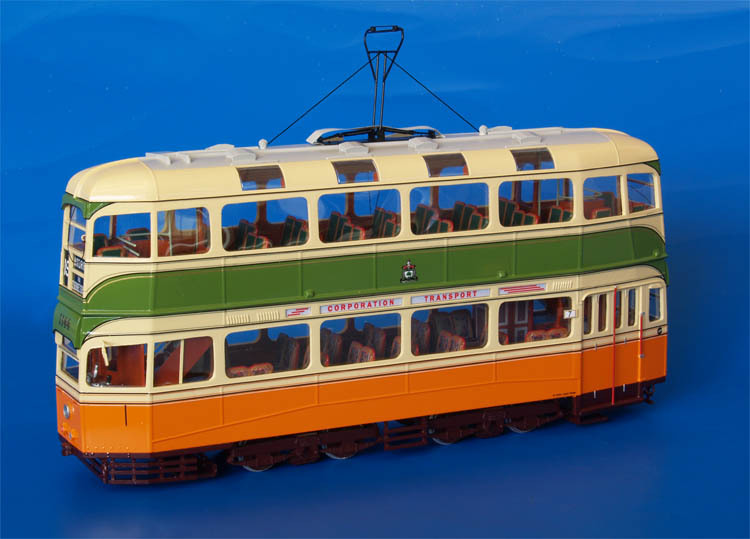 1937/39 Glasgow Corporation Transport Coronation Tram (1143-1242 series) - original livery.